^ A. S. Konopliv, A. B. Binder, L. L. Hood, A. B. Kucinskas, W. L. Sjogren, J. G. Williams. Improved Gravity Field of the Moon from Lunar Prospector. Science. 1998, 281: 1476. doi:10.1126/science.281.5382.1476. .
^ Iron Distribution - Lunar Prospector. NASA. [2008-07-14]. （原始内容存档于2008-06-26）. ^ D. J. Lawrence, * W. C. Feldman, B. L. Barraclough, A. B. Binder, R. C. Elphic, S. Maurice, D. R. Thomsen. 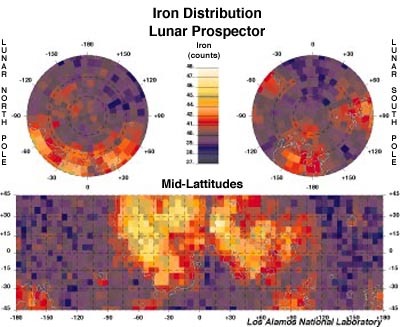 Global Elemental Maps of the Moon: The Lunar Prospector Gamma-Ray Spectrometer. Science. 1998, 281 (5382): 1484–1489. PMID 9727970. doi:10.1126/science.281.5382.1484. ^ Neutron Spectrometer Results. NASA. [2008-07-14]. （原始内容存档于2008-05-31）. ^ Doppler Gravity Experiment Results. NASA. [2008-07-14]. （原始内容存档于2008-07-12）. ^ Magnetometer / Electron Reflectometer results. NASA. [2008-07-14]. （原始内容存档于2010-05-27）. Lunar Prospector website. NASA. [April 24, 2006]. GRS results. Lunar Prospector website. NASA. [April 24, 2006]. （原始内容存档于2006年2月11日）. Alpha Particle Spectrometer results. Lunar Prospector website. NASA. [April 24, 2006]. （原始内容存档于2005年12月26日）. MAG/ER results. Lunar Prospector website. NASA. [April 24, 2006]. （原始内容存档于2010年5月27日）. Neutron Spectrometer results. Lunar Prospector website. NASA. [April 24, 2006]. （原始内容存档于2008年5月31日）. DGE results. Lunar Prospector website. NASA. [April 24, 2006]. （原始内容存档于2008年7月12日）. Eureka! Ice Found At Lunar Poles. Lunar Prospector website. NASA. [April 24, 2006].